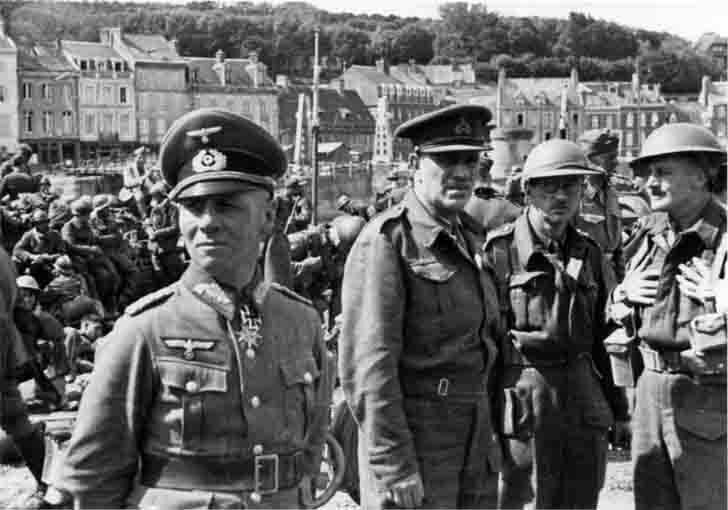 Legend of the Second World War, Major General Erwin Rommel, (commander of the 7th Armored Division of Wehrmacht) and captured Major-General Sir Victor Morven Fortune. Cherbourg, France, in June 1940. Erwin Eugen Johannes Rommel, 15 November 1891 – 14 October 1944) – German Field Marshal (1942) and commander of the Axis in North Africa. Major-General Sir Victor Morven Fortune – (August 21, 1883 – January 2, 1949) was an officer of the British Army. He saw service in both World War I and World War II. He commanded the 51th Division (Highland) Infantry during the Battle of France, then was trapped and forced to surrender to the Germans troops of theErwin Rommel. June 12, 1940.